In today’s digital age, you may have to do more than hang a banner to captivate audiences at an event. Smartphones and social media are killing our attention spans. In a study conducted by Microsoft between 2000 and 2015, our ability to focus has dropped from 15 seconds down to a pitiful 8 seconds. Eight seconds is one less than that of a goldfish. So your carnival pet might be able to win at a staring contest. There is a simple equation that needs mentioning. When it comes to conversion rates, engagement > visibility. Consumers are smart and don’t want a brand selling to them. Visibility and name recognition only go so far. Banners, backdrops and signage aren’t stimulating. Advertising should include a call to action from the consumer, but only if the cause of action is enticing enough for them to want or need. Creating demand with an offer or experience is the name of the game. But the presentation and effort required plays an important role in the user uptake. A great offer with an uninteresting method of connecting the user with the experience can leave a campaign dead in the water. Technology also replaces yesterday’s human touch through efficiency. No more filling out registrations or sign-up sheets required, which minimizes time and effort. Below are 5 unique ways to advertise at live music events. Each example is efficient, user-friendly and often drive high levels of engagement. Short-code text campaigns are great. Texting a unique word to a short number (often 5-6 digits) will return a confirmation code or discount to the user. Text campaigns gained popularity in the late 2000’s on the television show “American Idol.” They have become a familiar tool to consumers of all demographics. For advertisers, this medium collects a list of phone numbers that you can add to auto text campaigns. Having this direct pipeline to the consumer is invaluable as social media evolves and audiences shift to the newest, coolest platform. Broadcasting advertisements in venues is a new way to drive engagement. Fans hear radio-style ads over the sound system during set changeovers, and before/after concerts. This time is often dedicated to playing house music, so it’s a great time to present an event sponsor. In-venue ads are cheaper than radio or cinema advertising. They also focus on engagement over visibility, which often leads to a higher conversion rate. These ads require a device for playback and verification, but more venues are utilizing this technology. This is the fine line in the sand where the costs and opportunity increase. Beacon technology, known as Bluetooth Low Energy (BLE), interacts with consumers’ smartphones. If someone has an app on their phone and walks within range of a Beacon, they could receive an automatic push notification. (Note: The phone’s Bluetooth needs to be active and the audience needs to have the app using the Beacon.) In other words, there is no action required by the user to get the notification. Businesses that have apps can easily incorporate beacons into ad campaigns. No worries if your business does not have an app, as you have options. App building software and developers have become cheaper and more accessible in recent years. Advertisers also have the option of using popular third-party apps for beacon-enable campaigns. These include artist, venue, or reward apps, among others. After you have identified your destination app, align with a medium that offers beacon marketing and the rest is easy. RFID (radio frequency identification) has become more popular at events, especially music festivals. Through the use of RFID chips and readers, attendees can have a seamless concert experience. RFID allows for checking in and out of access points, push notifications (via app), and even make purchases. PromoWest Productions just introduced RFID technology the Bunbury Music Festival music festival in Cincinnati in June 2016. This led to several improvements from past festivals. By using RFID over cash/credit, all point-of-sale transactions happened via wristband scan. Attendees could load cards at pre-designated “Top Off” stations or through the festival’s app. Fast-paced lines and meant less time missing performances and happy attendees. With this tech making its way into more spaces like marathons, RFID may become cheaper and more accessible over time. Augmented and virtual reality may sound like the future, but in some cases are already available. These sponsorships and activations need third-party technology for broadcasting and viewing. But there are some cost effective workarounds, like 3D technology. Using a 3D projector, audiences can view imagery broadcast with basic 3D glasses. This can be an inexpensive way to display unique visuals at any live event. On the reverse, there are also scenarios that might cost a pretty penny. If you plan on projecting an image of Tupac, you will pay for everything from equipment to license fees. As more advertisers and marketers enter the space, the supply and demand will make this area less expensive. It’s hard to believe that these advertising methods are already available. A brand’s ability to interact with the consumer is better than ever, and who knows what the future will hold. 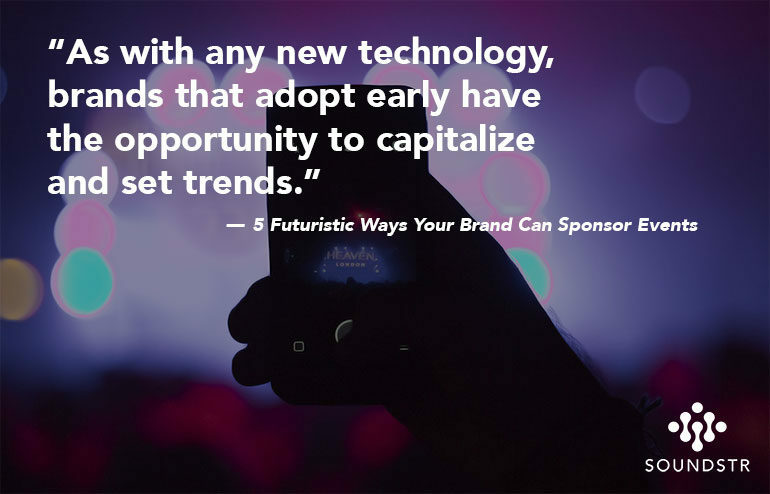 As with any new technology, brands that adopt early have the opportunity to capitalize and set trends. The only question is, will you be ahead of the curve? Interested in learning more about how your brand can explore these advertising opportunities? Click below for a FREE consultation. 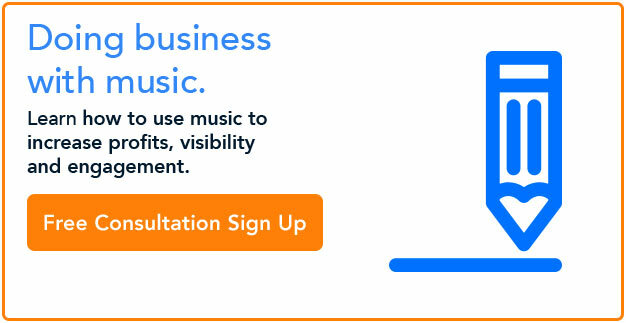 Why doesn’t your business sponsor live music events? Have you ever tried to sponsor an event? Do you have a hard time finding an opportunity that connects you to your ideal customers? Do you think it costs too much? Or are you just not familiar enough with how event sponsorship works? With changes to recent industry and consumer trends, it might be time to seize the opportunity. Concert goers are serious consumers. Audiences pay for admission, possibly a few drinks, and even merch from the performing musicians. As Digital Music News pointed out, in 2015 over half of all spending on music went to live events. Social media engagement is an entire different point of consideration. Ticketfly found that 31% of 18-34 year old concert goers spend more than half the time on their phone at events. This does not even account for the pre- and post-concert activity that is still tied to the concert. Live events are experiences for music fans. They are loyal to artists, food and alcohol companies, and even music venues. They also appreciate the right pairing of brands with live events. A study shows that 44% of concert goers have positive feelings towards sponsored brands. 40% said they were more likely to purchase sponsored brands. eMarketer discovered music fans rank higher in both areas compared fans of sports, TV and award shows. Statista reports that LiveNation, the world’s largest concert promoter, hosted over 25,000 events in 2015 alone. That’s an 11.9% increase from 2014. With events ranging from a few hundred to tens of thousands of attendees, imagine what that traction could mean for your brand. Brand spending to sponsors events is a growing industry. Sponsorship.com found that in 2014, music sponsorship spending totaled $1.43 billion dollars, a 4.4% increase from 2013. There is a direct correlation between the increases from audience and brand spending and the number of live events. Why wouldn’t you want to be a part of this growing industry? Sponsoring live events might be more affordable than you think. The days of spending thousands of dollars just to get your banner hung in a venue are over. Commitment levels for sponsorships are much less than that of other mediums such as TV and radio. Ad campaigns with these formats often run for several weeks or months, and focus on visibility and repetition. While these features might be helpful to some businesses, in-venue advertising focuses on engagement. Direct consumer engagement leads to conversions, and ultimately to sales. Considering that most events happen in independent businesses and venues, event sponsorship is a largely untapped market. Technology is quickly becoming the key to successful event sponsorship. Imagine an advertisement from your brand being broadcast over the sound system between acts at an event. Upon hearing that ad all audience members would receive a push notification with your coupon or offer. 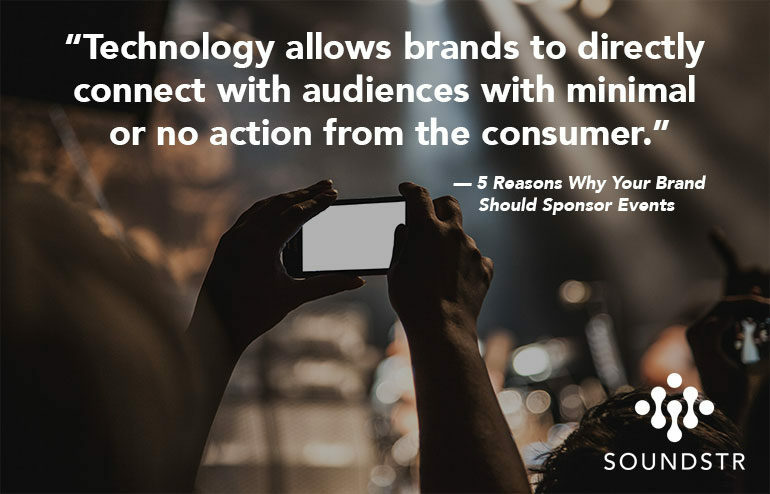 Technology allows brands to directly connect with audiences with minimal to no action from the consumer. It might sound futuristic, but these advertising opportunities are already available to brands. The world of event sponsorship has gone through dramatic changes in recent years. Consumers are spending more, and brands and events are cashing in. 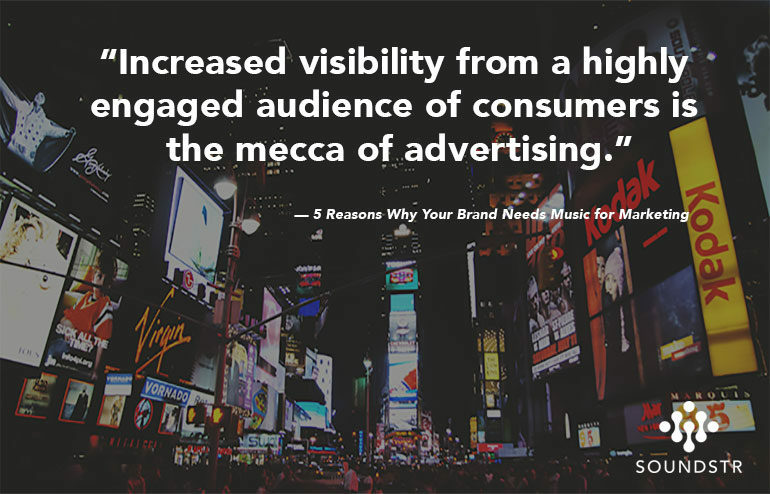 Concert goers are highly engaged audiences, and actually welcome the right sponsors at events. The costs and commitment levels are lower than other traditional advertising methods. New technology is helping brands connect with consumers like never before. There has never been a better time to sponsor an event, and the opportunity to position your brand might be closer than you think. 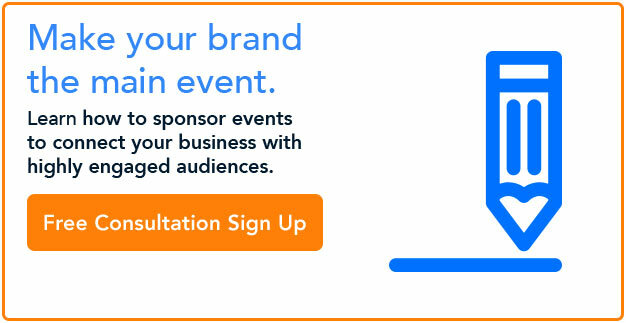 Click below for a FREE consultation on how your brand can sponsors live events.